Looking for something to do in Birmingham this weekend? Check out our list of events going on this weekend! The Greater Birmingham Humane Society is pleased to announce its second annual Halloween fundraising event, Howls & Growls, presented by MedJetAssist, will be held on Friday, October 28 at Iron City. Guests will enjoy a performance from The Molly Ringwalds and Halloween fun, all while raising funds to support the thousands of homeless, abused and neglected animals who find hope and help through the GBHS every year. Attendees are encouraged to come in costume and doors open at 7 p.m. prior to the show starting at 8 p.m. General admission tickets are available for $50 each and include beer and wine selections. A limited number of VIP tickets and tables are also available starting at $125 per person and include an unlimited premium open bar and food. Tickets can be purchased by visiting Iron City’s website or calling (205) 202-5483. The Sixth Annual Surgeons versus Chefs Pumpkin Carve Off is this October 29, 2016 beginning at 10 a.m.! Brookwood Baptist Health has partnered with the Market at Pepper Place to present the this Annual Pumpkin Carving Contest. This festive event pitting top orthopedic surgeons against top chefs is free and open to the public, rain or shine. All children are encouraged to wear Halloween costumes and cheer for their favorite participant. Pumpkins will be judged on precision, skill and creativity! Bring the whole family to Leeds Elementary this Saturday, October 29 beginning at 8 a.m. for the Monster Mash Dash! The events of the day will include the Fun Run for students in grades K-6 beginning at 8 a.m., followed by a 5K beginning at 9 a.m. Our vendors will be open from 8 a.m. – 2 p.m. and will be located on the field behind Leeds Elementary School. Come out to the Red Mountain Park beginning at 11 a.m. for the First Annual Tricks, Treats and Trails! 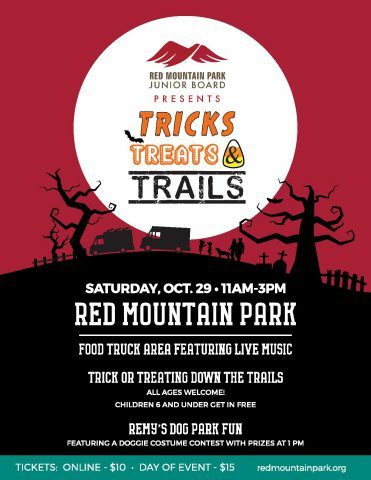 There will be Trick-or-Treating down the Trails at Red Mountain Park (all ages are welcome! ), a Food Truck Area, Live Music, and Remy’s Dog Park fun featuring a doggie costume contest (with prizes at 1:00 PM).Tickets are $10 online and $15 day of event. Children 6 & under free. Stop by Long-Lewis and find the right vehicle to get you to these great events!